The Mint was very busy in 1917 and 1918, producing small change in huge quantities, sending much of it overseas with American soldiers serving in World War I.
French newspapers at the time ran stories describing how French merchants liked the Buffalo Nickel in particular. In the rush to meet the high demand, somehow a 1917 die was impressed with a 1918 hub, resulting in an overdate. The 1918/7 overdate was first documented in 1930, with little fanfare. It did not gain its deserved notoriety until 1947, when it was listed in the first edition of the Guide Book of United States Coins. Its estimated value was listed at $40.00 in Fine condition and $150 in Uncirculated. Since then, the 1918/7-D Buffalo Nickel has displayed a stellar record of price increases. The coin is rare and greatly prized in all conditions. 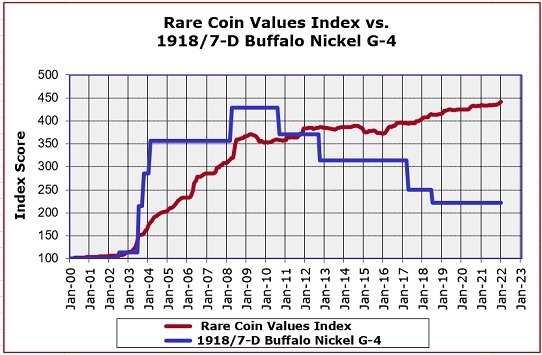 The blue line charts the value increase percent since Year 2000 of the 1918/7-D Buffalo Nickel in G-4 condition. The red line is our Rare Coin Values Index, which charts the collective percent change over the same time period of a cross-sectional group of 87 rare US coins. Both blue and red lines begin at a baseline score of 100. The 1918/7-D Buffalo Nickel is one of the 87 rare coins, and as you can see, outperforms the Index. The idea behind the Index is to measure the overall direction of the United States rare coin market, and is updated monthly.